A prestigious collection of the connoisseurs wine choice. Included are 6 exquisite bottles of Vina Alarde Crianja Riojas. These beautiful wines are some of the oldest and finest names in Rioja with deep ruby red colours, delicious vanilla overtones of juicy soft strawberry and morello cherry flavours. 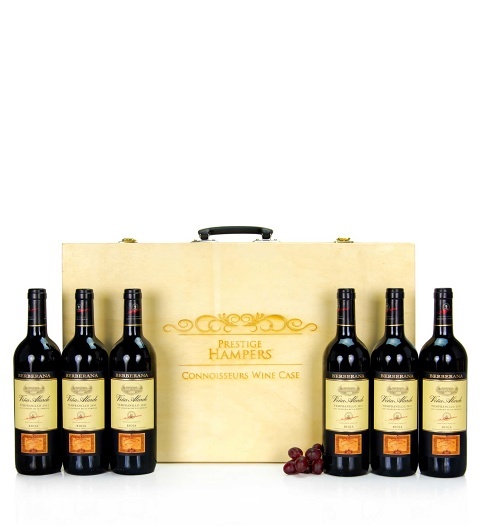 The wines are presented in the wooden Connoisseurs Wine Case, a perfect gift to send to those who adore fine wines. The Connoisseurs wine Choice is available for UK next day delivery.